It has been a busy time leading up to the summer this year. There is no doubt that a combination of factors have definitely had an impact on Inishowen now being highlighted as a “must see and explore” destination; filming at Malin Head for Star Wars has encouraged film crews to investigate the area for other productions, positively promoting the iconic scenery and landscape that surrounds Ireland’s Most Northerly Point. Inishowen Tourism has experienced an upsurge in enquiries to assist film crews with itinerary and information on possible options for particular features. In the coming weeks there are several organised meetings to facilitate these visits in order to maximise promotion and development for the area and its knock on effect for the business community involved in tourism. Last week the hugely successful Clonmany Festival attracted visitors from all over Ireland with the programmes flying out the door on request. Additional radio stations and broadcasters travelled to the Peninsula to celebrate the electric atmosphere and buzz around the week’s music and activity. 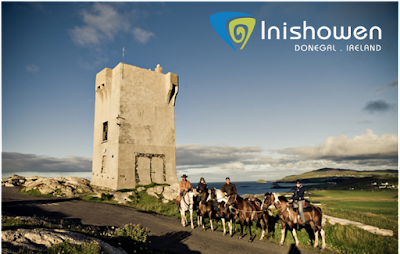 Currently Inishowen Tourism are developing plans to bring more to the table as such in a strategy to provide cultural specific interest tours in collaboration with other bodies; these are proposed for next year . Specific interest tours can coincide with commemorative, historical or culturally associated events that can be tailored to increase the dwell time in the Peninsula often during off peak periods and mid week that benefit our tourism members and attract a wider audience from more diverse backgrounds and countries of origin. Back in the office last week, Marie McDonald (originally from Moville) who is the Assistant Producer from Waddell Media came by appointment especially to feature an interview for the episode of the “Getaways” programme. It was highlighting the Inishowen 100 Scenic Drive, themed with taking a break in Ireland. Talking to Marie during sound checks she expressed her delight at getting the chance to promote her county and in particular the Peninsula. The episode occupies a thirty minute broadcast on holiday destinations abroad and a five minute feature on taking a break here in Ireland. The Buncrana Tourist Office has been highlighted by tourists in the recent 5* Trip Advisor award as one of the most helpful and useful facilities in the Northwest. It provides additional services; overnight parking for motor homes, the Amazing Grace Park adjacent and the “Wee Library” on site. It was after a conversation with Marie about our facility here in Buncrana that she decided to film here. A short interview ensued in the Amazing Grace Park with presenter Mairead Ronan (Today Fm broadcaster) giving an overview of the place, story and its visitors to the area. Keep abreast of the events and stories with Inishowen Tourism, find us on Facebook and visit us on our website for up to date information.